The National Transportation Safety Board estimates that there are over 300 fatal accidents caused by wrong way drivers each year. And while the problem of wrong way driving has been a concern for some time, various states are noting an increase in wrong way accidents in recent years. 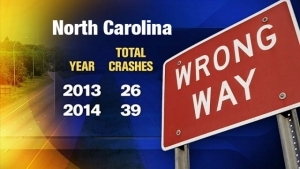 Officials in North Carolina report a 67% increase in wrong way crashes in the last year. Georgia officials marked a 100% increase in crashes involving wrong way vehicles from 2013-2014, and the numbers for 2015 are even higher. In the last four years in Texas, it has been reported that 269 people have died in wrong-way crashes and another 2,800 more were injured. And in the last year, those numbers have risen by 13%. So what does this all mean? It means that highway and law enforcement officials across the country are becoming alarmed and are actively searching for flexible, effective and affordable ways of curbing wrong way driving situations and accidents. The announcement of Trafficalm’s new product WrongWayAlert™ is being enthusiastically received by these officials especially because of it’s simplicity, scalability and affordability. The WrongWayAlert™ intrusion warning system can be retrofitted on existing Wrong Way signage, and yet has the flexibility to fit many highway traffic situations because of radio communication between its detection/activation unit and remote warning devices on other area signs. State officials are consistently surprised at how affordable WrongWayAlert™ is, making it possible for them to install the Trafficalm warning system in many more dangerous intersections than with other more expensive systems.